Sitz bath is a natural healing method which is an effective and soothing way to soothe the injury caused due to the vaginal delivery. After delivery for 30 days using hot water(not so hot – use warm water) for bathing is in practice which is so relaxing and it also helps to maintain a healthy routine. While bathing in hot water, start by washing your toes first and then move upwards to the head. In ancient days people use to take bath in the river.when they enter in the river, feet will touch the water first and so on.So body heat will go up from feet to head and come out via mouth, nose or ears. After having a relaxing oil massage, using hot water (not so hot – use warm water) for bathing is practice. A daily bath using hot water will help to keep your stitches clean and will also help to soothe any soreness and reduce any swelling. Helps to relieve from cold. 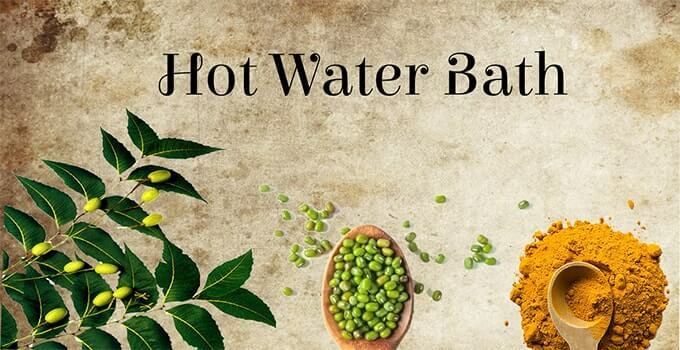 Neem leaves and nochi leaves are added along with water while boiling in order to prevent from cold and the growth of disease-causing microorganisms. Neem leaves-Adding neem leaves in bathing water is a traditional Indian practice.Taking bath with neem water can give infinite health benefits.Anti-bacterial property of neem helps to protect from skin diseases. Nochi leaves-Prevents from catching a cold. Turmeric(manjal) and green gram flour(sirupayaru) powder is preferred instead of soap to prevent from infections. Turmeric-Helps to prevent from infections like cold, cough etc. as she runs the risk of passing the same to her infant.Helps in mastitis. Green gram flour – Helps to maintain your skin in a healthy way. Use Shikakai powder instead of shampoo. After bath sambrani smoke is made and hair has to be shown over it. This is to prevent the mother from catching a cold. My grandma advice is to use warm water(lukewarm water) whenever you go the toilet and pour it over the stitches for fast healing from the pain caused due to stitches. Once or twice daily, you can sit in a tub of warm water (sitz bath) which will soothe the area and help with the swelling. You can also add salt along with warm water. Warm water helps to dissolve the stitches. It is natural and extremely effective and gives positive results every time. Sitz bath also provides relief from pain when the stitches are healing. Second, have a relaxing hot water bath.